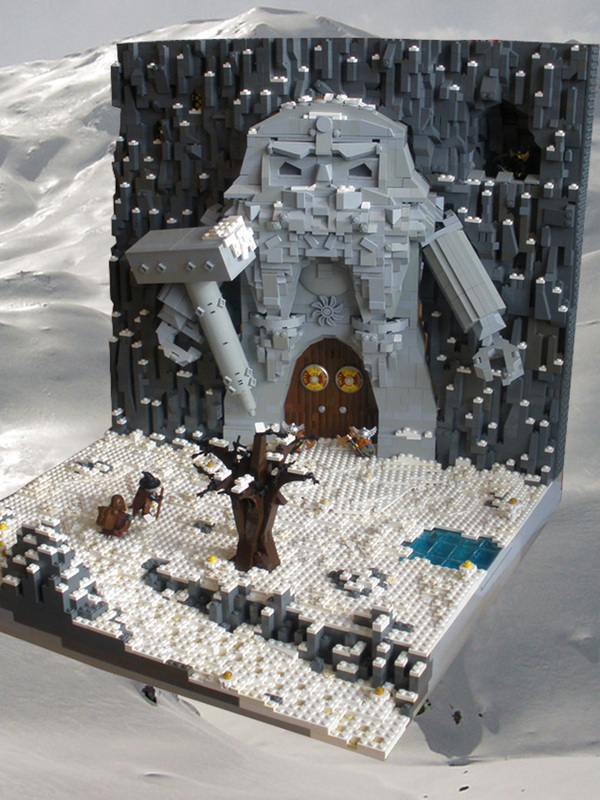 Tom Snellan presents a beautiful snowscape at the entrance of a dwarves’ mine. The most impressive feature is definitely the sculpture of the giant dwarf (pardon the oxymoron), which very closely resembles its minifig counterpart. I also like the combination of using droid arms and arch bricks on the tree, which adds a realism that either alone can achieve. That is absolutely fantastic! The dwarf sculpture is great, but I love the little frozen pond, which breaks up the white landscape beautifully. I really like the 1×1 plates scattered around the cliff side. It gives the appearance that snow is falling. That’s wonderful! I agree wholeheartedly with Curtis–from the angle of the image posted it nearly seems to be “snowing” in that scene!